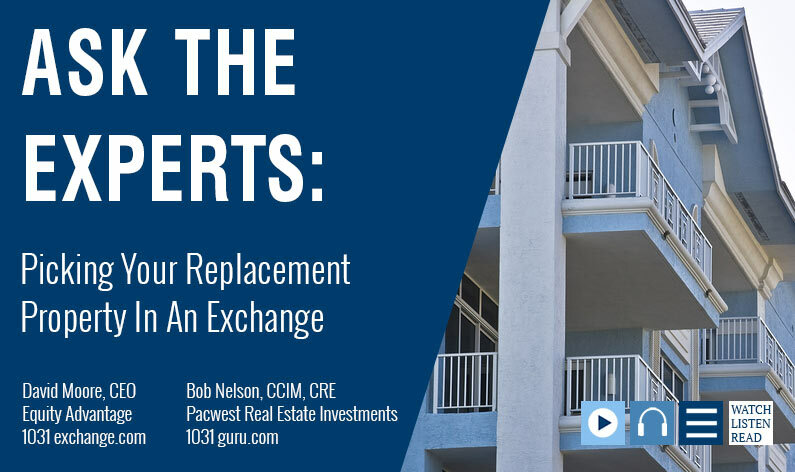 David Moore and Bob Nelson lead you through finding a replacement property to complete your 1031 exchange. And in this market, that’s usually the toughest thing about a 1031! David Moore: Hello, once again David Moore with Equity Advantage, and I’m pleased to state that I’ve got Mr. Bob Nelson of Pacwest Real Estate here with me once again. David Moore: Well, thank you. And where we left off, Bob was talking about characteristics of properties. And in today’s market, things are getting a little frothy. Bob Nelson: Yes, they are. David Moore: Things are getting a little high-priced, tighter transactions. We sort of left off talking about timing deals, and I wanted to state that we can buy a property the same day the relinquished property goes away. We can do a reverse exchange if you need to. We’ve been doing them for more than 26 years now, so it’s something that’s there. It’s a proven process. We’ve got safe harbors provided by the government. But still, if we can avoid a reverse, I encourage my clients to do so. David Moore: So, with that said, when you’re looking for these transactions, what characteristics do you look for in a property? How do you say, “Hey, this is the thing I want, and start working for it,” and you’re committing to it. Correct me if I’m wrong, you’re trying to get commitment to work towards the acquisition before anything’s ever sold. Bob Nelson: Absolutely. Absolutely. If you don’t do that, you’re wasting the most valuable thing in the exchange. That’s the time period that’s allowed to go out, seek out the property that would be the replacement property or properties. You can certainly acquire more than one. David Moore: And then, let me interrupt you. David Moore: So, if we’re talking about a rental house, a single-family rental house, it’s probably no big deal. David Moore: … yeah, you’ve got to use CCIM skills. That CI101 comes back in, right? All that work that you did to get that stuff, you’ve got to employ that to really justify it. We’re not talking paint colors, we’re talking about quantifying numbers. Bob Nelson: And not just the numbers, it’s the benefits that the property would produce for you. Why am I acquiring a property for its ability to deliver future benefits? The benefits of an ideal income property. I don’t like land. I don’t like development. I like to deal with passive investment income. That’s the thing the majority of the people are after. That allows them to retire whenever they feel like they would like to retire, not when the boss tells you’re out to pasture. So, ultimately, if I can allow the individual to start thinking in terms of a property producing cash flow, a certain amount of cash flow, if we’re dealing with tax-shelter items, depreciation at interest expense. Those are some of the items that got touched on a bit in the new tax reform act. Bob Nelson: Also, principle reduction. We measure that. If a tenant is paying 12 monthly rent payments, I’m gonna use a portion of it to pay down the mortgage loan, so it’s like the tenant is paying off the loan for me. That’s a benefit of ownership, and certainly the appreciation in value. The fact is that it will go up in value. If I can identify through you which of those benefits would be most important, and I’m talking in the next five years, which of those benefits would be most important? If you can quantify that, then I have the capacity to go out and look for property that would produce those specific series of benefits. They are not all people. They are not all the same. Even the property that would two properties identical, but financed with different financing produce different benefits. Bob Nelson: So, if I can identify the benefits and I have the capacity to go to the market, find property that most fit those criteria, and ask you, “Please consider this.” Allow you to make the final selection, but knowing that it’s going to produce the thing that you’re after. It’s not potluck, it’s not by accident that this happens. Well, I guess it could be by accident, but oh my gosh, not in a 45-day period. Bob Nelson: So, if we can deal with things along those lines, then it become very easy to go out and start to select in a two-week period of time. Which is starting with the sale of the property that you’re going to be exchanging forward. And starting with that sale the 45-day period, it’s fairly to say, “Hey, this is the best stuff that’s out there and available right now.” Now, if a better one comes a long two years from now, that’s the breaks of the game. But we have this brief window of opportunity. You have to select from what’s there. And if I’m a good broker, I can access inventory that you would never see. And I’ll be bringing in things for your review that maybe aren’t even on the market, but I know through other brokers that this is a very doable transaction, and my objective is to get you in the best possible position. When we start making offers, which will occur at the end of the second week, and if everything works well, we’re getting pretty close to being able to close the transaction at the end of the sixth week, which is the end of the 45-day period of time. Bob Nelson: But again, I’m going to ask you to look at more than just one, because things can happen. And it’s not a mistake. It’s not an accident, but it would be if we didn’t do this type of planning. I like to do that type of what I call exchange engineering. In fact, I insist on it if we’re gonna work together. David Moore: Well, it sound like it takes a lot of work to qualify the properties, and qualify your buyer. You remember Ron Stash, and Ron always used to be famous, in my mind, for ruining my investments. Because I’d go buy something, and his whole deal was, “What am I gonna make? How am I gonna make it? When am I gonna make it?” You have that plan to be realized, and we’d go through and do it, and my brother Tom and I had a lot of properties together, and we’d go that process, do the thing, and then Ron would come in and say, “Well, gee, when you gonna sell that?” And I’d go, “What do you mean, when am I gonna sell it?” And sell meaning exchange, by the way. David Moore: But we were flipping properties in 1990, and we just weren’t bright enough to have a TV show at the time. But the funny thing was, he’d come in and torpedo the deal. He’d say, “Look, you’ve got too much equity,” because the thing had changed in value, even though we were happy, we had great tenants, he had just ruined the investment for us, and we had to choice. We had to either cashout, refi, or do a 1031 Exchange? Bob Nelson: It’s all in the process. If he’d been leading you through from the beginning, he would have eliminated some of the things that you would have done. And that’s what we’re really after now. You’re the best at exactly what you do David. And with that type of knowledge as an exchange facilitator, one of the five requirements of a tax-deferred exchange, and if you’re dealing with somebody that just happened to be an escrow company of some sort, you’re not going to have that type of talent. So it’s important. David Moore: Well, thank you. Bob Nelson: Oh, absolutely. And I meant every word of that. It’s critical. It’s absolutely critical. David Moore: The check’s in the mail, Bob. Bob Nelson: Oh, yeah. There you go. David Moore: Well, thank you very much. It’s been a pleasure, and I hope you found it helpful, and once again, David Moore with Bob Nelson, Pacwest Real Estate, and thank you for joining us.